New in our blog rotation is spotlight interviews with our amazing teachers! We wanted to tell you all about how they got started, what amazing work they are doing and inspire you to be a part of it! This week we interviewed Susan Landa. She has owned and operated retail stores for over 27 years. She founded The Fossil Cartel, a gem, mineral and jewelry store in downtown Portland, in 1989. She also owned and operated Let It Bead, a full-service bead store, for 16 years. Her newest dream is to open permanent brick-and-mortar red tents around the country, to empower women and help shift the negative paradigm around women’s cycles into a positive celebration. She’s calling these modern day red tents Moondays. What brought you to SomaSpace and what about this space did you find that resonated with you in order to decide to offer your classes here? I was looking for a wide open space that was located on the Eastside of Portland, beautifully decorated (preferably with reds,) proper lighting, had a music system, chairs, a kitchen and was reasonably priced. Tell me a little about your experience (what led you to what you’re doing now, how you learned it, etc) and what it is you teach here. After I read the book, The Red Tent, by Anita Diamant, I was longing for a space to join with women in a similar fashion as depicted in the book. Since one didn’t exist, I came up with a business model to fulfill this yearning and am carrying out plans to create this vision. Meanwhile, I host monthly Red Tents at SomaSpace to build a following so that when I do establish the brick and mortar space, I will have a built in clientele. What do you find special about the modality you offer? How has it transformed you and what transformations do you often observe in your students/clients? I believe there is too much masculine energy on the planet and it is creating an unhealthy imbalance. The earth and its inhabitants is crying out for tender loving care, connection and healing- all of which are feminine principles. The more women empower themselves, the better off we all are. I believe having a place for women to come together, nurture and empower themselves and each other, will help towards raising divine feminine energy and ultimately heal the planet. I myself am empowered for taking a leadership role in facilitating the Red Tents. 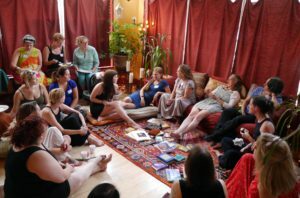 The women who attend are taught how to tap into their feminine power and use it in their day to day lives. Connecting with women and emboldening them to be strong and become their finest selves. What is the funniest moment you have had as a teacher and what is the most precious? The most precious moment I’ve had was when I did my first Mother-Daughter Red Tent and performed a menarche ritual (first moon) for my daughter, Jule. I can’t think of the funniest moment, but I can think of the most awkward! It was the year I was using a different Greek Goddess for each month’s theme. We were on Athena. One of the things Athena was known for was her civic engagement. The activity I came up with for this Red Tent was to write a letter to a representative to let them know how they felt about a particular issue. That didn’t go over very well! The women revolted and didn’t want to have anything to do with that activity! I was able to be flexible (a feminine power!) and by consensus, we changed the activity to simply sharing issues that were important to us. What do you hope your students take away from your work/classes? To become strong and in love with being a woman, to form new friendships, to fill a void that many women feel of disconnection with other women, and to know that this matters. Learn more about Susan on her bio and find out more about her next Red Tent and Moonday’s here ! 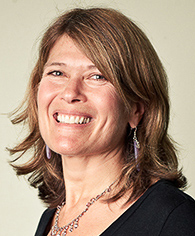 Thank you Susan for the healing work you do and for being a part of SomaSpace community!